If you are a bookworm and always look for opportunities to dive into reading then you should search for jobs that will satisfy your need to be around books and reading. Reading books is a hobby that relaxes your senses. 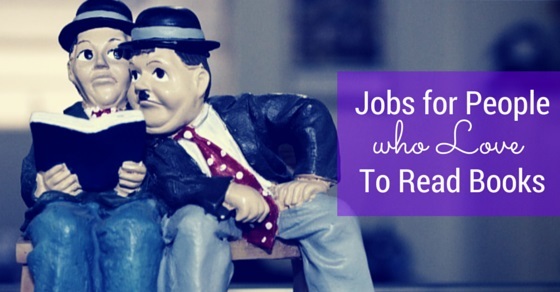 If you found yourself helpless from the addiction of reading and want it to be your career then below are certain jobs for book lovers that will be of great use for you. Most jobs that require reading books also include writing assignments and related proofreading work. You can work for agencies or work as a freelancer. As a blogger you will have to specialize in a subject for which you will have to engross in extensive reading of books on that same. You will need to have in depth knowledge so reading many books particularly to cover the subject better is necessary as part of research. Owning a blog as a career may be a risky venture and you might want to work in an alternative job also. Nevertheless there are established blogs for which you can write articles. As a novelist you will have to read other books for inspiration and new ideas for your own book. It is very difficult to find success in this field so you can keep a collection of pieces of work and once you are an established author you can go for publishing all of it. You can self publish your books if you are not responded by an agent. Reading is the main feature of an editor’s job. Books, online publishing or magazines all need editing and proofreading as well for improvement. As a bookworm you surely can flourish. As an English teacher or professor you will get a chance to share your passion with students. You can analyze many books and get fresh outlooks of it for the young kids. Working as a librarian is the first though any book lover would have. You may not always be reading books but you will always be around books and share your devotion of books with other like-minded people. You get to grab the latest releases and if you are collecting you will get to check the selection of books. A literary agent is the mediator for an author and publisher. They represent writers and help with payment and contract negotiation. Very less publishing companies accept submissions without an agent. If you are a part of a publishing house you are also an element of the process of selection of award winning books for printing. Some of the tasks of publisher includes appraise manuscripts, edit it, discover apt cover design and work on marketing ways. If you are looking forward to owning a business and want to integrate your book reading love, you can start up a small bookstore. This way you will be around books and new releases and help others with their book reading passion. Hunt for companies that deal with books, they need a lot of reading. There are positions where intensive reading is required and as a bookworm you will easily slot in. Archivists are accountable for collecting, arranging and preserving vital documents and other kinds of records. There are many opportunities for the written documents but some may be dull like legal contracts. But if you love reading and arranging you will fit in. As a reporter you can work for magazines, newspapers, televisions, websites or other media companies. They are mainly responsible to report news events that have impact on human society. For being credible and unambiguous a reporter has to research a lot which involves reading and gathering particulars. It may also involve writing reports which will require your skills developed by reading. There are no absolute educational requirements to become a reporter. The job of proofreaders is to read the copy, correct and check for grammar, punctuations and spelling mistakes. Reading is the basic and fundamental element of this job. It is one of the top jobs if you seek to be paid for spending time reading the whole day. If you have curiosity about politics and you are enough aware about the politics then political science is your field. Political scientists have to read and research about the origins and development of political systems. The operations of these systems have to be analyzed. Different government policies have to be read and studied. Some are documented in books for book lovers. If legal matters intrigue you then you can choose this career. Lawyers spend a great amount of time reading. Lawyers have to research and by now you are well aware that research and reading go hand in hand. If cuddling with contracts, patent records, or a thick book on legislation sounds amusing to you, then you fit in the slot. Paralegals assist lawyers with tasks that include organizing legal documents and evidence, conducting research and maintaining reference documents. All of these works require extensive reading and interest in legal proceedings. Historians are responsible for analyzing, interpretation and researching the past by examining historical documents and relics. As a historian you will get to read books, contracts, historical records, diaries and newspapers, and other similar documents so that it helps in developing the accurate depiction of human, culture, event and time. You can read a lot of scripts of films or television series etc submitted by writers for possible production. Your duty will be to check for any obscenity and put right immoral or misleading sentences. Picking the best and putting the submitted scripts through various levels of test by reading appropriately is the task of script reader. If you have designing interests with reading passion this job will be best for you. You will need graphic designing skills, along with writing, reading and editing skills. You can work for a company in-house or freelance. Next best option for a reader is writing and as copywriter you will be given with a specific topic for which you will be needing lot of reading and research through interviews etc. Advertisement scripts and jingles, slogans to encourage people to buy a product is one of the many topics a copywriter writes on. A public relation specialist needs to prepare press releases, information for client’s media image and speeches. The PR is responsible to build and maintain positive image for their clients. The tasks requires a PR to read and research for what to say and what to not. If you are interested in reading facts and figures this job is appropriate for you. If you like searching through information, analyzing reports, and collecting data, you might enjoy this job. As a book reviewer you read books and critique them on the basis of the employer’s conditions, such as the capabilities of the characters to be believed, mood, plot, setting, tone and significance. Freelancers are given one to two books and several weeks for the reviewers to read and then evaluate about it. A book conservator is responsible to conserve and restore books, documents and manuscripts. Cultural heritage is the main activity that a book conservator involves in. Paper based items, such as books, scrapbooks, maps, post card and newspapers display distinctive apprehension when it comes to conservation and care. If you like being around historical documents and books this will be apt job for you. You can become an illustrator by reading books and providing visual representation. The complicated concepts of novels, books, manuals etc can be clarified by illustration. This is most common for children’s books. A translator translates a written copy of the book into a different language. For instance if you are a native Japanese speaker who can read English and speak English fluently, you can be hired to translate an English novel into Japanese. A degree in the second language will be helpful as the translator is expected to read and rewrite the copies taking into consideration grammar rules, sentence formation, expression and word connotation. This profession brings you close to reading in two distinct languages. Your job generally refers to promotion of the books. If you have enough media contacts you can easily turn into book publicist. You will be accountable for marketing a certain book, scheduling signing of books, connecting to major newspapers and contacting radio or television producers to advertise a book. If you are a book addict and love to spend time in dedication to books, from above list you can understand that there are jobs meant for book readers who have developed specific skills from reading that includes knowledge on writing, grammar, analytical thinking, heavy imagination skills and common knowledge, smart and creative approaches. Thus now you are aware that there are indeed plenty of job options for a book lover. All you got to do is explore more and come to a conclusion.